The MayaWorks artisan group of San Marcos La Laguna is located on the shores of Lake Atitlan in Guatemala. Artisans hand-crochet the vibrant, high quality kippot that MayaWorks sell in the US and Canada. In addition to the kippot, these artisan create the crochet Mary Janes and Beanies, pouches, and hackeysacks. In recent years the women from this group started a community thread shop where they purchase thread at wholesale cost and sell to people in the community. This project began with funds from a MayaWorks Grant. Artisans also participate in a Spanish literacy training program, receive eye exams, and are enjoying microcredit loans all funded by MayaWorks. Another group of artisans create beaded jewelry, mezzuzot, ornaments, and personal accessories on small hand looms. 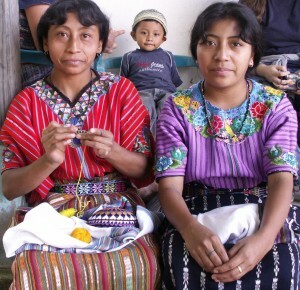 Artisans from Santiago Atitlan are the only group that speaks Tzutujil instead of Kachickel, both indigenous Maya languages.